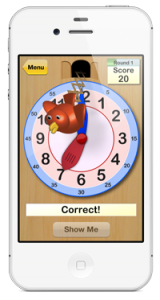 New to the Apple App Store is a free app I created to help teach children to tell the time. It’s a fun little game featuring an interactive cuckoo clock. This is the latest in a series of apps I am creating using Flash and Adobe Air for iOS. For a long time now Flash has looked like a dead end technology, but the ability to develop for iOS, Android and the Desktop simultaneously has really given it an extra life. I’ve been very impressed with the results so far. I think it is also especially suited to games and widget apps, but is also great for creating interactive prototypes of more complex mobile apps. Clock Watch is free on the App Store. This entry was posted in Internet and New Media on 20/5/2013 by ddewhurst.